What's New for September 2017 - Issue 2 | Freedom House, Inc.
That’s the message more than 100 people heard on the evening of Monday September 18, as Freedom House ministries in partnership with the Bonner County Drug Court and Tamarack Treatment and Counseling Center recognized National Mental Health and Substance Abuse Recovery Month at the Ponderay Events Center in Ponderay Idaho. Several speakers shared their journey through recovery from addiction to drugs and alcohol and how treatment through Christ-centered recovery programs, and the Bonner County Drug Court program have enabled them to embrace recovery and live changed, productive lives. Judge Barbara Buchanan, First District Judge and Drug Court Judge, shared the strengths and success of the program and described ways in which the community could provide much needed support including more safe and sober housing like the Sweet Magnolia house scheduled to open its doors to women in recovery on October 1. Judge Buchanan also called for employers to be more flexible in providing job opportunities for individuals. Winona Wilson of Tamarack Treatment, discussed how mental health issues are often at the core of addictive behavior and how families and the community at large can be more effective in identifying potential addiction issues early-on. Bonner County Sheriff Daryl Wheeler, discussed the results of a survey of local high school students which indicated that nearly one in three students had used some kind of drug during the prior thirty days and the implications for the future of our community of that level of addiction. Sheriff Wheeler also presented a strong case for reducing the flow of drugs through additional law enforcement resources, and increased public awareness. 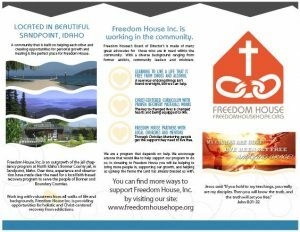 Check out our great new brochure to learn more about Freedom House Inc. ministries, then print it out and share it with others to get the word out. We are counting on our readers and supporters to help us spread the word about FHI! You will find the brochure and other important FHI documents on our new Resources Library page. In standard PDF form, this brochure is easy to view, save, and print out. We are now taking applications for our safe & sober housing facility for women. You can find the application on our Sweet Magnolia page on our website–just fill it out online, then print and mail it in to FHI. We will be opening Sweet Magnolia on October 1st! We have much more going on behind the scenes at Freedom House Inc. ministries which we will be sharing in future newsletters and also on our Facebook page – please join us & help spread the word! 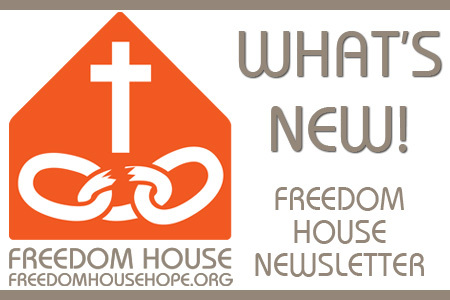 Want to keep up with all that is happening with Freedom House? Then be sure to sign up for our newsletter and never miss out!